But throughout the whole post-war period the Australian Government’s aim was to strictly limit European Jewish immigration: The fear that anti-Semitism would rise was Calwell’s primary concern. Therefore, Jews, and Jews alone, had to declare their ethnic or religious origin on the immigration forms. Additionally a quota system was introduced which limited the number of Jews on any boat or plane to 25 percent. Despite these restrictions, the Australian government eventually allowed thousands of Shoah survivors from the DP camps to come to Australia. The first ship, the French liner Ville d’Amiens, with about 180 Jews on board, docked at Sydney harbor in November 26, 1946. 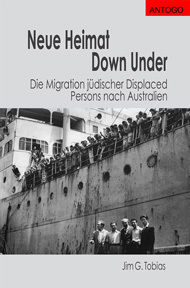 Ultimately, Australia accepted about 17,000 Jewish refugees from the DP Camps and Communities in Europe; that was the second highest number of Shoah survivors, in relation to population size, after Israel. These Jewish „new Australians“ faced the problems of adjusting to a new language and culture and struggled with the psychological traumata of the Shoah. Despite these huge difficulties most of the immigrants found happiness in Australia and became loyal and thankful citizens. One common reason – and certainly not the least important – for immigrating to such a remote place as Australia, was to get as far as possible from the scene of the catastrophe. The story of the despairing survivors of the Shoah who spent years stuck in the middle of the land of the perpetrators, yearning for a new and safe homeland, and finally finished up living in Australia, has remained mostly untold until now – especially in Germany. The film-project „A new home down under – the migration of displaced persons to Australia“ is related through eight contemporary witnesses. The 29 minute TV documentary „Destination: Down Under“ (German) was broadcasted (terrestrial, cable and via satellite) by the regional TV station Franken Fernsehen in February 2011. (German) has been released in November 2013 incl. the TV documentary „Destination: Down Under“.